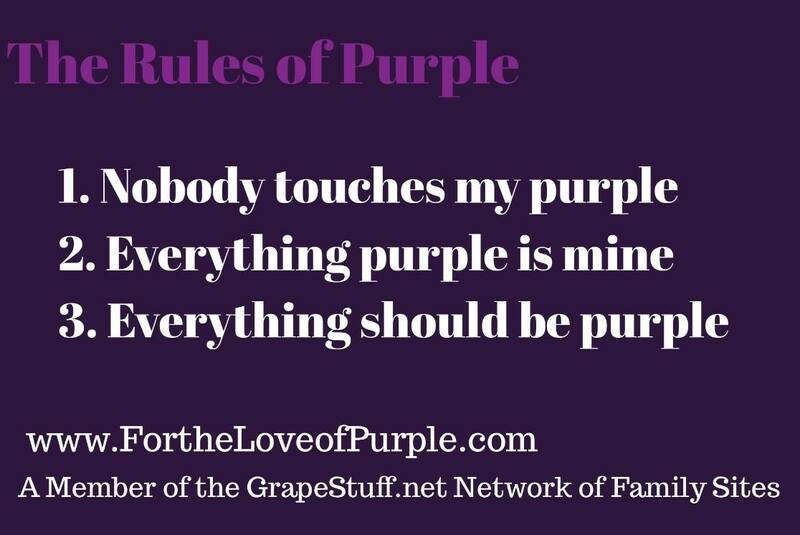 I have polled a ‘grape’ number of you over the years both here and on the For the Love of Purple Facebook fan page, and it has confirmed what I have long suspected about purple lovers. We are a different breed of fan. There are seven reasons why purple lovers are different from just about any other group of lovers on the rainbow spectrum. The vast majority of us have been infatuated with our favorite color for decades! Most of the purple fans I polled said they had loved purple as far back as they could remember. For some of us (hand raised high), that is a considerably vast time span. Most purple people don’t report having a second favorite color – unless you consider a shade of purple to be a different color…and most of us do! When asked what their second favorite color is, most purple lovers report it to be lavender. After asking many other lovers of various colors, I found that while people may like pink or blue or green, they don’t talk about their favorite color with as much gusto as do we. Many people who claimed blue or green as their favorite color reported having clothing in other colors as well. And while some pink lovers did confess to buying a lot of pink, the vast majority didn’t turn their world as pink as purple lovers dyed their universe purple! The sheer number of people who were willing to dye their hair purple far outweighs the number ready to dye their hair pink or blue. Even those who said their favorite color was red didn’t dye their hair red with as much frequency as did purple lovers according to my research. There are quite a few more redheads than there are purple heads, but the ratio of purple lovers to purple haired purple lovers far outweigh the redheaded red lovers. I’ve heard stories that would turn your face purple! If it doesn’t come in purple, we won’t buy it…sometimes even if we desperately need it! And if we don’t need it, but it comes in purple, we’ll probably buy it anyway. Purple people report having relatives send them odd items in the mail simply because they are purple. My father sent me a giant lavender paper clip once – just because it was a shade of purple. Some of my fellow purple fans have spent extra money to get an appliance in purple. Others have told me that they have special ordered something to get it in purple. Looking over the data from my fan page, I’ve found that the posts they like the most are the ones that tell the world how much purple lovers love their purple. 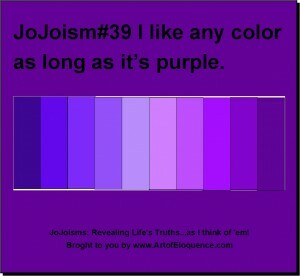 They love that even more than looking at purple pictures and almost as much as buying new purple things. After many years of talking to purple people all over the world, the one characteristic that stands out about us grape people is that we tend to be a creative bunch of individuals with unique insights. For whatever reason, purple lovers tend to be what others might call oddballs. We revel in our own individuality, and we tend to respect others’ unique qualities as well. My theory about why purple lovers are so passionate about their favorite color is that most of us were not able to buy products in our favorite color until recently. When I was a little girl, my grandmother went to four stores trying to find me a purple dress. Invariably, I’d get a blue toy because it was “close to purple.” I remember being so disappointed that I wasn’t able to find a purple notebook for school or lavender paint for my bedroom walls. These days, if you have the money to spare, you can buy a purple oven for your kitchen or a purple car, and whenver possible, we do!